Why hire Nick Bastian to be the REALTOR to sell your home? While any REALTOR may be able to ultimately get the job done, you deserve a professional who is constantly looking out for your best interests. Nick Bastian has been successfully selling real estate in the Valley since 1992. A listing agent needs to understand marketing, representation, the local market, and he needs to know EXACTLY how every part of the residential purchase contract can work to YOUR advantage. Nick has listed and sold hundreds of homes all over the valley. For many years, many of Arizona’s top home builders have trusted Nick to help them with their contingency management needs. Builders like Centex, Ryland, Pulte, KB Homes and more have relied on Nick knowing that he will get the job done professionally and efficiently. Nick and his team of professionals take marketing and representation VERY seriously. They are not going to just stick a sign in the front yard and hope that your home will sell. Every one of Nick’s listings is professionally photographed, extensive web and print campaigns are implemented, and multiple online strategies are put in place to create a very complete and detailed marketing attack. In 2014, Nick was hired by the National Association of REALTORS to help write the curriculum for a new training manual to teach real estate agents across the country how to help market and sell homes for their clients. Nick has been a speaker, committee member and Chairman at the Arizona Association of REALTORS Annual Convention. 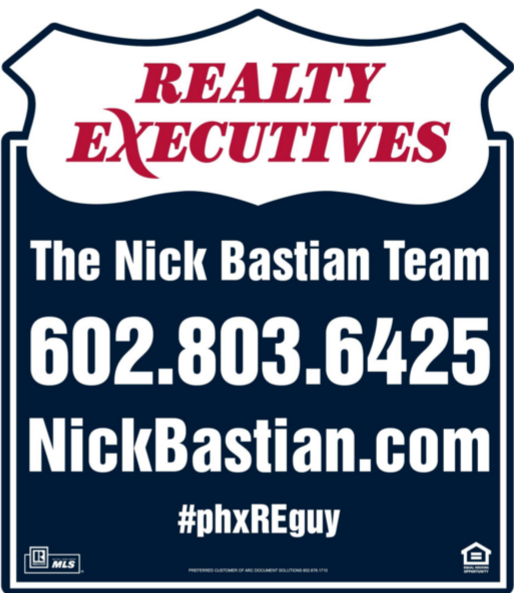 Nick has been a member of several committees at the South East Valley Regional Association of REALTORS. In 2009, Nick was honored to be a part of Tempe Mayor Hugh Hallman’s State of the City Address. Mayor Hallman thanked Nick for his community involvement and for his marketing expertise. Here’s a link to some testimonials from past clients, as well! Nick serves as a member of the Board of Directors at the Tempe Community Action Agency. Nick is a member of the Exchange Club of Tempe. A community service orginization dedicated to improving the lives of all. Nick is a Member of the Government Relations and Transportation Committee at the Tempe Chamber of Commerce. Nick serves as an Executive Leader at Realty Executives where he works closely with agents, ownership and the entire brokerage team. You can also click here to learn more about Nick and his career.